Sometimes a hotel is the destination. That was certainly true for my visit to Memphis earlier this month. Visitors who know anything about the city beyond its world-famous barbecue and vibrant music culture know The Peabody Hotel. The Peabody is a throwback to a different era, both for hotels and Memphis itself. Dating to the 19th century, the present-day building, inspired by the style of the Italian Renaissance, was erected in the mid-1920s. As the saying goes, they don't build them like that anymore. It was built for a Memphis that, frankly speaking, no longer exists. Back then, Memphis was a major economic hub. Cotton was king. One prominent writer said the Mississippi Delta — the South’s South — started in the hotel’s lobby, where a literal who’s who gathered both to conduct business and to be seen. The Peabody remains the finest hotel in Memphis even if its raison d'etre has changed. On any given day the lobby is filled not with businessmen but tourists watching the twice-daily march by the hotel’s famous ducks to and from the fancy sculpted marble fountain and their special rooftop abode. The spectacle, which includes a duckmaster dressed in regal-esque livery, is admittedly tourist kitsch. It’s also a moneymaker as most of the onlookers sit around and order an expensive drink or two from the old-school lobby bar. I know what you’re thinking: Is it safe to leave the hotel? To be honest, I was cautious. After all, Memphis is regularly ranked as one of the country’s most dangerous cities. But being from Detroit I knew the city couldn’t be that bad. 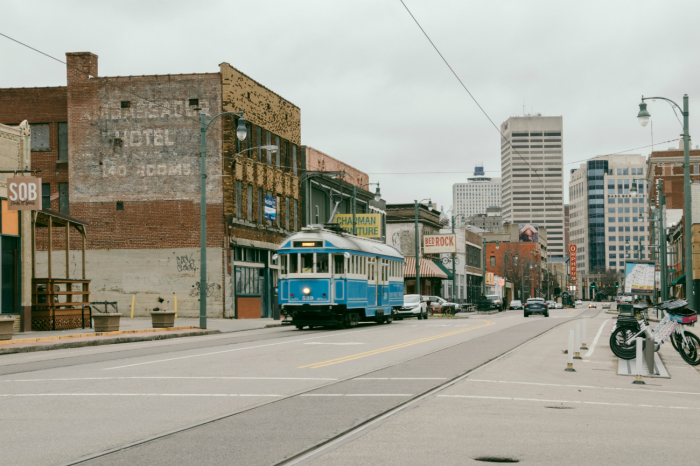 The Peabody’s location in the heart of downtown is within walking distance of pretty much everything from iconic Beale Street to the Pyramid on the banks of the Mississippi River. I walked around and never felt unsafe, though, as with anywhere, exercising care and common sense is a must. This also gave me a good feel for the city, which is in the midst of redevelopment. In many ways, it reminded me of Detroit five or six years ago. The Brooks Museum of Art, located in Overton Park in the city’s midtown, is a small but impressive museum. Among the collection are several fine French impressionist works by Pissarro, Renoir and others. Nearby is the Memphis Zoo. Even more impressionist art is on display at the Dixon Gallery and Gardens, though I found weekend opening hours to be rather inconvenient for out-of-town visitors. A different kind of museum is the National Civil Rights Museum, which incorporates the old Lorraine Motel. Of course, this was where Martin Luther King Jr. was assassinated on April 4, 1968. The must-visit museum goes beyond the story of King and effectively tells the story of a dark and most unfortunate chapter in American history. While I’m not much of a music connoisseur there was no way I could visit Memphis and not see Sun Studio, the birthplace of rock-and-roll, and Graceland, the home of Elvis Presley. One area of Memphis to keep an eye on is midtown, where a former high-rise Sears store and distribution center was redeveloped into Crosstown Concourse. The mixed-use redevelopment includes the Next Door American Eatery. Speaking of food, I ate dinner one night at Chez Philippe, The Peabody’s AAA four-diamond restaurant. It’s just what you would expect, though it was somewhat overshadowed by hustle and bustle of the lobby bar. The other night I tried The Lookout, the super casual restaurant atop The Pyramid with amazing views of the Memphis cityscape and Mississippi River. The food was better than expected, but the overall dining experience was ruined by the endless number of tourists headed to the observation deck. My only real complaint about Memphis was the cost of visiting. Just about everything came with a charge. Seven dollars here. Ten dollars there. This adds up after a while. A single card that gave visitors entry to most or all of attractions would be a great product for local tourism officials to offer. Delta Airlines flies to Memphis nonstop from Atlanta, Detroit, Los Angeles, Minneapolis–St. Paul and New York City. All of the major car rental agencies also operate out of Memphis International Airport.